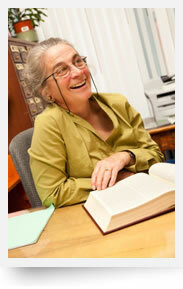 Law schools and law professors provide the foundation for successful legal professionals. When they help students make good decisions based on realistic expectations, they remain far ahead of the competition. It’s no mystery that women face different challenges than men in the male-dominated legal profession. It also is no secret that women’s double-shift of responsibilities at work and at home is driving change and encouraging flexibility in the workplace at large. From having children to caring for aging parents, women shoulder a unique burdens, which affect them and their families throughout their careers. Susan Smith Blakely educates young women in law school about their options and potential for fulfilling careers—having this knowledge while still in law school helps students create career paths that work for them. It also is no mystery that millennial lawyers want something different from practice than Baby Boomer and Generation X lawyers. 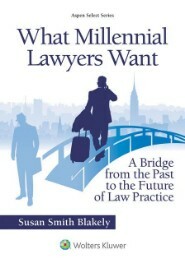 What millennial lawyers want is an important topic among lawyers today, and Susan Blakely provides insight into the world of new generation lawyers in What Millennial Lawyers Want: A Bridge from the Past to the Future of Law Practice. Meryl is a law professor at a prestigious school, and she’s seen a lot of students come and go. She knows that some of her former students aren’t happy practicing law. At least half of the students in Meryl’s classes are women, and she would like to think that most of them will be satisfied in practice and will continue with their career plans. But that may not be the case, and she thinks about it a lot. She also knows that many of the young male students will find challenges. Meryl was concerned enough to talk to the other law professors about adjusting the curriculum to help improve these retention figures. She wants to give her students a leg up on the competition and prepare them for survival in the legal profession. She also knows that if her students are successful in their careers the law school will benefit as well. 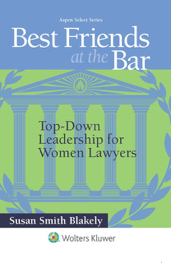 One of her colleagues suggested that she read a the powerful new resource, Best Friends at the Bar: What Women Need to Know about a Career in the Law, for some guidance. Meryl discovered that the book fit in well with established law school programs and courses. It would make an excellent summer reading assignment for students entering law school and result in lively discussion during orientation. The book also would be great for small group discussions in seminars on “Women in the Law” and “Gender and Law” and “The Future of Practice”. 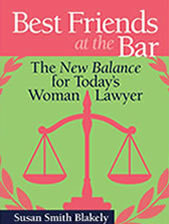 Meryl also knows that the second book, Best Friends at the Bar: The New Balance for Today’s Woman Lawyer, would help the students in those seminars address the work-life issues that threaten so many careers and that the students would benefit from the transition profiles of remarkable women lawyers, who have come face-to face with those struggles and have reached successful outcomes. Meryl recognizes that the information in the books is critically important for young lawyers planning legal careers and dealing with work-life struggles. The lessons presented in the books also will be invaluable to women lawyers working with male colleagues in a variety of legal settings. There is even exciting information about a clinical program at the University of Maryland Law School to prepare young women law students for practice. Meryl has been concerned for some time about the overemphasis of theory and the lack of emphasis on practice in law schools today. The time has come for more innovative programs that can make all the difference for her students. Meryl decided to propose adding a similar program at her law school—and inviting Susan Blakely to be a guest lecturer was a natural first step. Meryl is feeling more and more confident about the future of women in the law. Contact Susan to discuss speaking at your event and bringing the message of empowerment in Best Friend at the Bar: What Women Need to Know about a Career in the Law to your law school students. 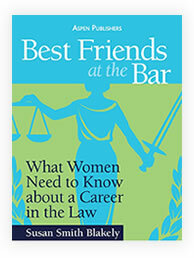 If you would like to purchase wholesale copies of Best Friends at the Bar: What Women Need to Know about a Career in the Law, for your school you can find more information on the Aspen Publishers’ website.